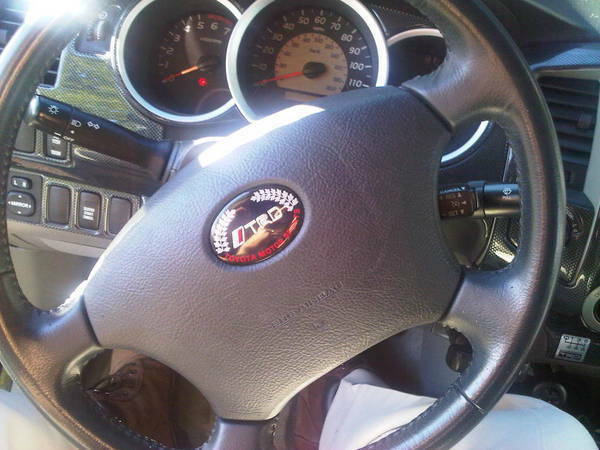 Discussion in '2nd Gen. Tacomas (2005-2015)' started by HomerTaco, Oct 22, 2010. I like it! What was the part called? What were the keywords? I've had it for a while, just decided to put it on today after work. hey it's a perfect fit. Homer, is your truck the same one from "Back to the Future" (part 1)??? If so, your coolness factor just increased! I'm not really as thrilled as I thought I would be with it... It's different though! All packages will take 9-12 days ( Not inculde weekend) by Airplane with registered. i thought i had seen something on here before about getting the steering wheel chrome logo out, but i can't find it. how did you get yours off? I could not find them so i just got under the symbol with a straight pick and pried it off! I took a Dremmel to the raised plastic that was left over then just stuck the new one on. I felt the same way - this was the last visible Toyota symbol on my truck. looking good craig. when u getting me that job at homedepot so i can afford to do some new upgrade to my truck lol.